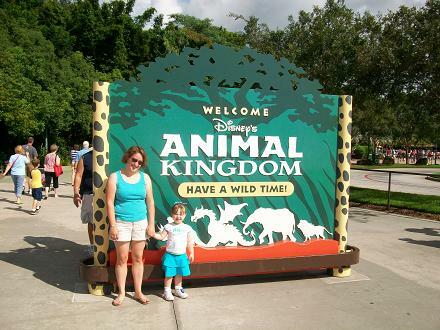 The second day of our trip to Disney we decided to start out in Animal Kingdom. We got up bright and early to get there before the crowds. We stopped to pose for a quick picture before we went into the park. 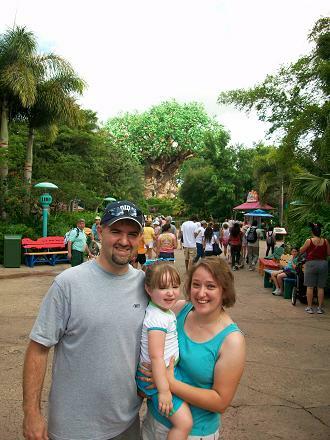 Rich, Hailey and I with the Tree of Life in the background. 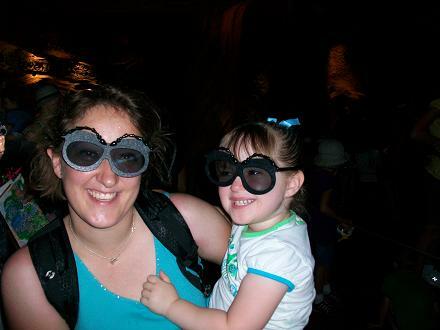 Me and Hailey waiting to see It’s Tough to be a Bug, inside the Tree of Life. It’s a really fun 3D show. As we were heading on to check out some more rides we saw that there was only a 5 minute wait to meet Pooh, Eeyore and Tigger. 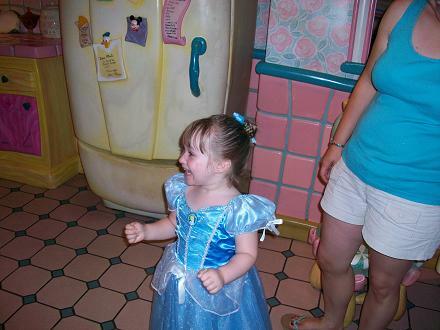 Hailey was so excited when she had her turn to meet Pooh. I don’t think I have ever seen her so excited- the look on her face was priceless! She ran right to give him a big hug, so you can’t really see her face. 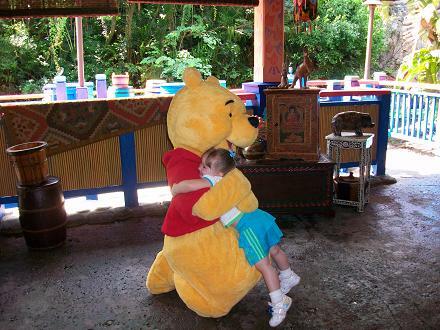 Hailey giving Pooh a great big hug. 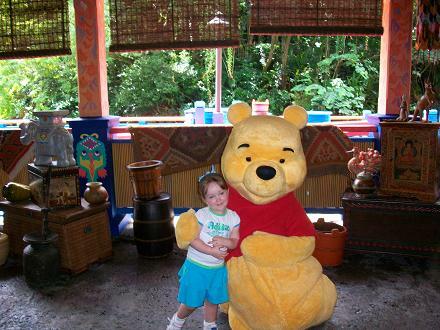 Posing for a picture with Pooh. 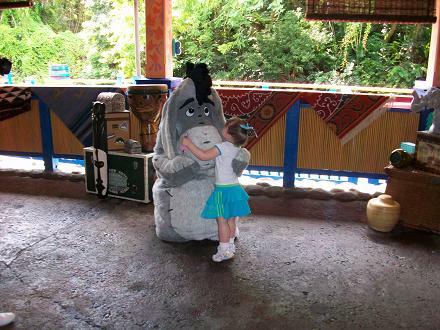 Hailey gave Eeyore a big hug and kiss. 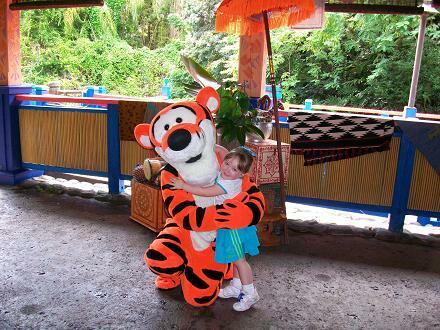 And a big hug for Tigger too! After her hug Hailey started bouncing up and down and asked Tigger to bounce with her. 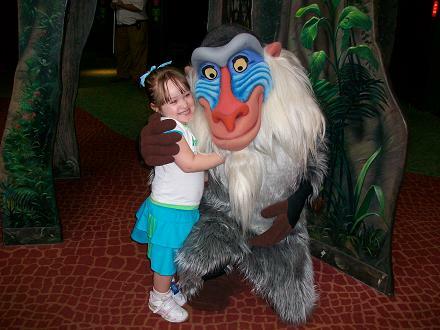 Hailey loved meeting the characters so much that after meeting Pooh, Eeyore and Tigger she kept asking where the other characters were and when she could get their autographs and pictures with everyone else. 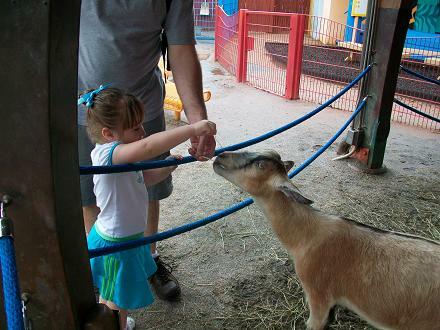 We enjoyed the Affection Station (petting zoo) too. 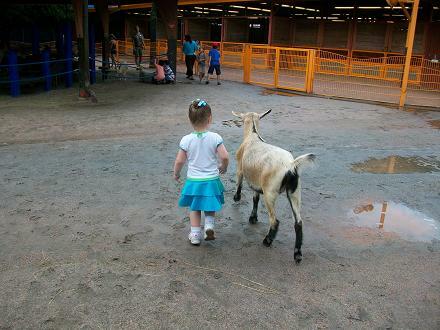 Hailey was thrilled to be walking next to a baby goat. And she loved feeding another goat. Then Hailey found out there were some more characters. 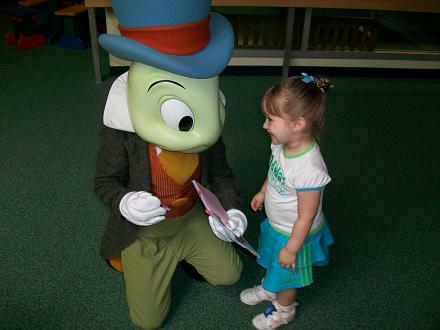 Hailey got an autograph from Jiminy Cricket. I wasn’t even sure if she knew who Jiminy Cricket was, but she kept asking where Pinocchio was, so apparently she does know who Jiminy Cricket is. 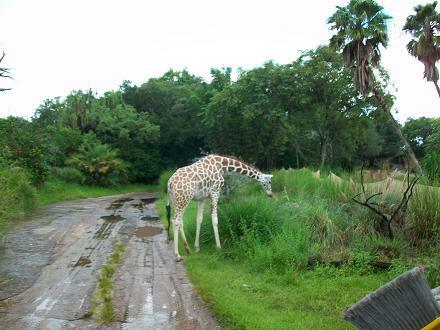 After a train ride back to the main Animal Kingdom part we went on the Kilimanjaro Safari ride. 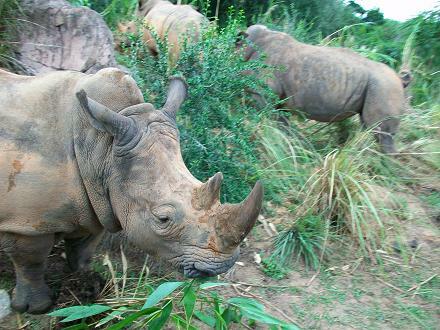 There are African animals that roam around and you get to see these animals on the ride. We saw some pretty amazing animals! It’s a bumpy ride, so a lot of the pictures came out blurry- here are a couple that came out pretty good. We finished up at Animal Kingdom and then we went to Magic Kingdom for our dinner reservation. 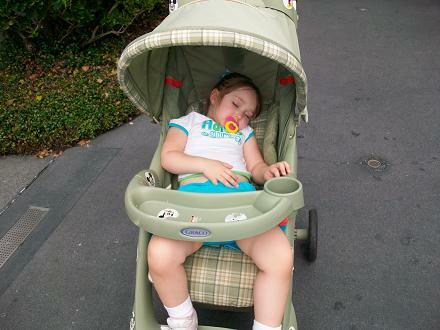 Hailey took a little nap, one of only a couple of naps she took while we were there. 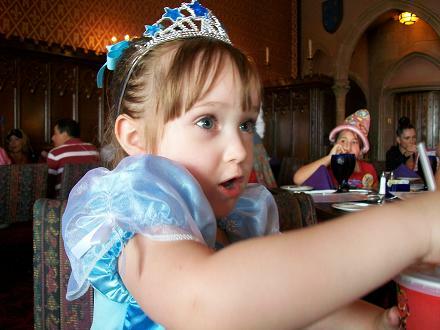 After her nap I took Hailey and got her ready to have dinner in Cinderella’s Castle. 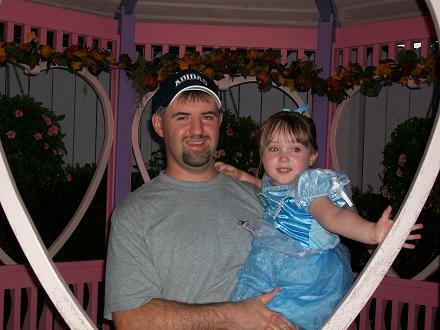 Rather than take her to the Bibbidi Bobbidi Boutique to have her hair done for $50 I decided to do it myself. I put her hair up and sprayed lots of fairy dust (glitter) in her hair. I must have done a good job because one of the Disney photographers commented on us having her hair done at the boutique. 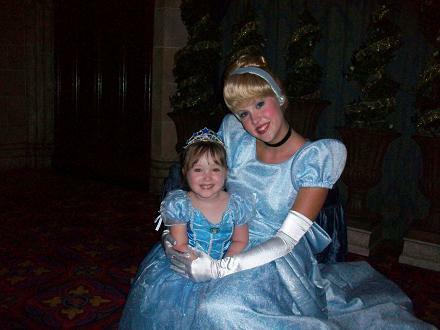 Hailey and Cinderella posing for a picture. Then we went upstairs in the castle to eat dinner (which was also free- as I mentioned yesterday- all of our food was free!). Hailey trying to take everything in. 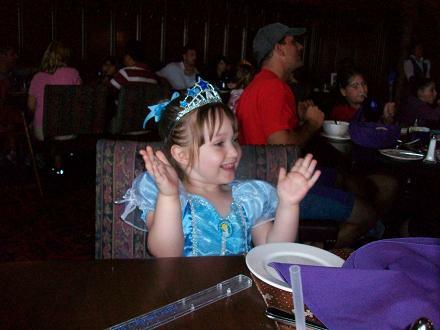 Hailey got to meet Cinderella’s mice and the Fairy Godmother during dinner. 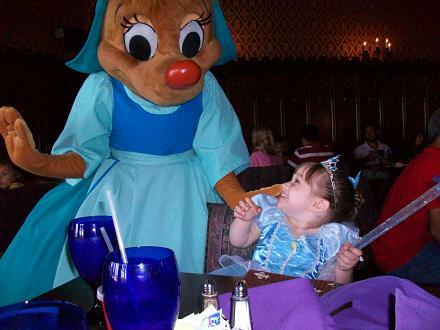 I think this mouse is Suzy. Clapping along with the songs during dinner. Us posing for a picture in the castle after we finished dinner. 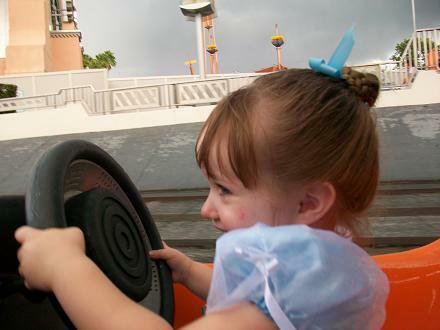 After dinner we went on some rides- Hailey loved being able to drive on the Tomorrowland Speedway. 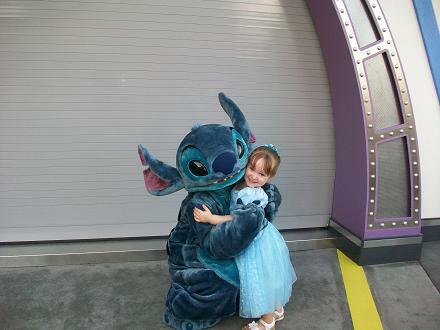 Then Hailey spotted Stitch- one of her all time favorite characters. 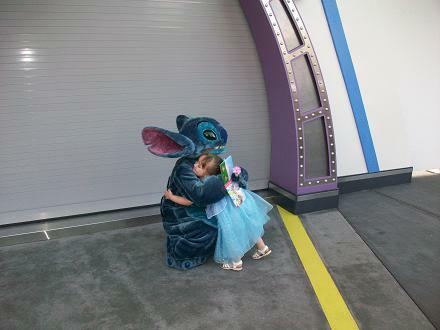 She gave him a huge hug! Then they posed for a picture. 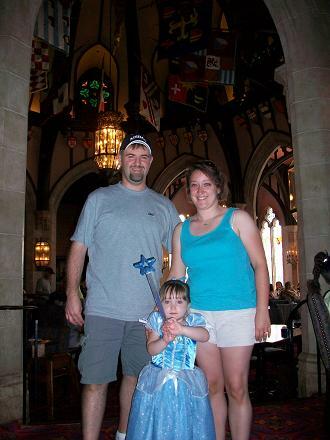 Hailey loved Minnie Mouse’s house- especially her kitchen. Rich and Hailey in the gazebo in Minnie’s backyard. 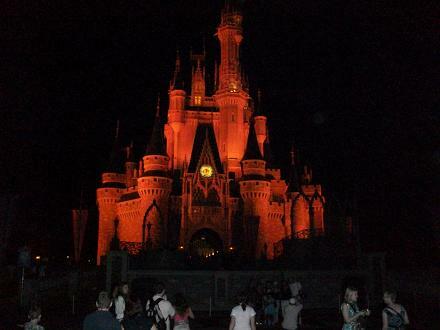 A night-time picture of Cinderella’s Castle. 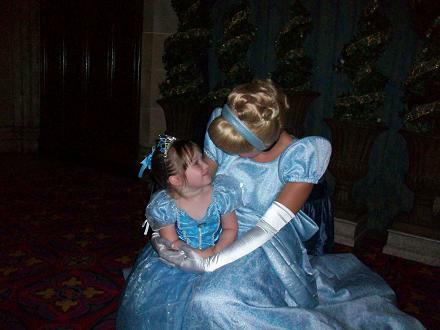 I love the pictures with Cinderella! 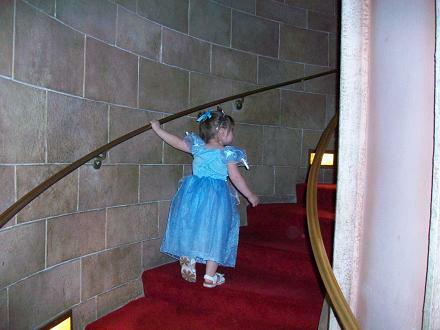 She looks just like a mini Cinderella. Great pics!! SO FUN!! And you are looking really good in all of your pictures by the way!